Chemo Duck Cartoon Premiere: It’s a Wrap! 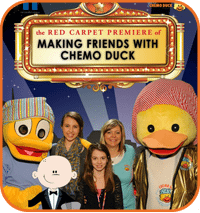 On Saturday, January 5, Gabe’s Chemo Duck Program premiered the “Making Friends with Chemo Duck” cartoon at Monroe Carell Jr. Children’s Hospital at Vanderbilt. The cartoon was shown in the Children’s Hospital Theater and to the kids receiving in-patient care. The event, presented by BL Harbert International, was free and featured red carpet makeovers, pictures, celebrity goody bags, snacks and more! The cartoon was a big hit and it will soon be available On Demand through EZTV for all patients at Vanderbilt’s Children’s Hospital to view. A portion of the cartoon has been available on YouTube for two years. It has been viewed more than 11,000 times. The additional final four minutes of educational material will allow us to teach thousands of children about chemotherapy in a child-friendly, non-threatening manner. The video sheds light on some of the struggles children go through and reiterates the fact that they haven’t done anything wrong and that they are still the same kid on the inside. The cartoon appeals to children of all ages and helps them understand that they are not alone. The production of the cartoon took three years to create and has been a true labor of love. We are so grateful to everyone who took part in the production of the cartoon, for the generous sponsorships and for the helpful on-site management of the event. It’s a huge step toward our goal of reaching out to children with cancer and helping to provide comfort, education and hope during a very challenging time.